long distance cycling – wife. mother. awesome girl. Yesterday I embarked on my local bike club’s annual ride from Philadelphia to Brooklyn, the Peter O’Dell Memorial Ride. I struggled with the decision to go, having a few very low days emotionally and wasn’t sure I’d be up to the challenge not only of pedaling (I chose the 90mi route) but also of being upbeat and mentally ready. My last significant rides were 110mi in early July and a metric a few weeks ago – so I’m not exactly in All Day Epic shape. In the end I decided I would regret not going more than regret going (and I could always take the train back home if I felt it necessary). After waking entirely too early (5am!) and picking up my friend Ken, we arrived at the New Hope, PA starting point right at 7am. Many other cycling friends were also milling about, making final preparations for the ride – Kurt, John, Catherine, Phil, and Jeff (who was SAGing this mostly-unsupported ride for us), among others. 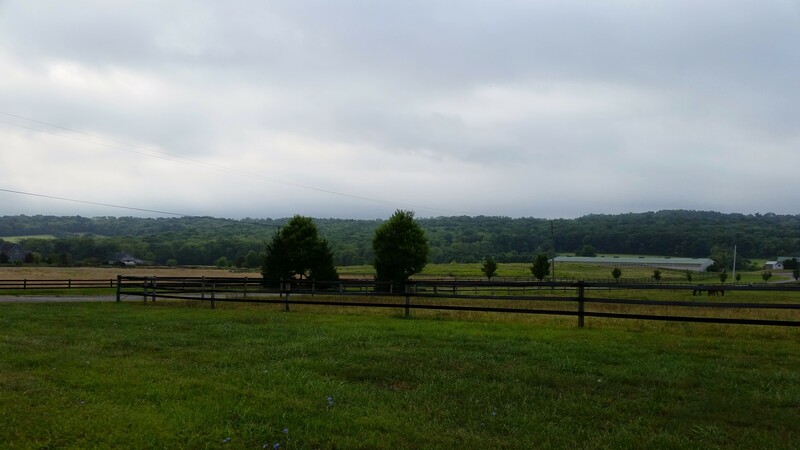 We loaded our shower bags into the bus and started the journey about 7:30am under cool but humid cloudy skies. The first thirty miles were mostly rural, passing fields of pumpkins, corn, and apple orchards. We stopped in Raritan, NJ at the local Wawa-wannabe (Quick Chek) for bathrooms, ice water and a brief snack. The lunch stop was “only” 12 miles later so we didn’t feel the need to refuel too much. Those 12 miles included a hill that just. kept. going. 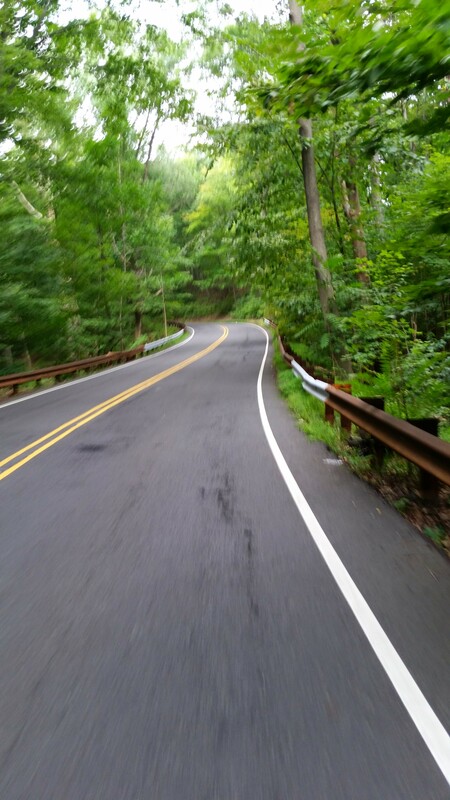 Every turn, the incline kept going – about a mile at a 6% grade. Ken and I had swept up another cyclist on the ride, Adam, and stayed with him through the hill. He ended up staying with us until just after lunch. At this point we were literally dripping with sweat and sipping our electrolyte-enhanced beverages frequently. Lunch in Lyons, NJ at a Subway. Apparently New Jersey doesn’t have any good local hoagie shops? Food is good and so is air conditioning, which we relished as the sun had burned through the clouds and the temps were climbing into the upper 80s. A quick jaunt north to Basking Ridge to see a 600+ year old tree. It was pretty impressive. 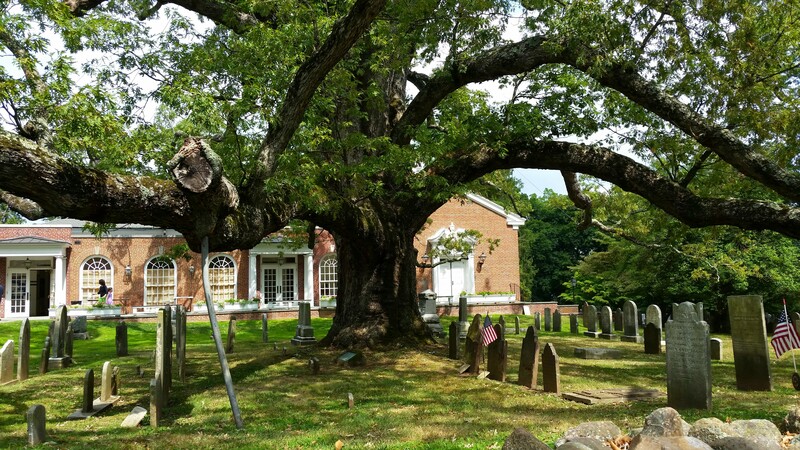 this tree is over 600 years old and in a church’s side-yard cemetery. By this point, Ken had switched off with Dave, who had been piloting a tandem with our friend Catherine, who happens to be blind. Adam hooked back in with a larger group of cyclists. So I pedaled off to catch up with Ken at the next rest stop in Kenilworth, NJ. And oh, was this the most delicious part of the ride. I zipped along, unencumbered by others. It’s not that I don’t love riding with my friends (I prefer it, actually) but sometimes the solitude is exactly what is needed. As I turned on to Sky Top Rd, I knew this was going to be an excellent hill. I didn’t attack it but I didn’t submit to it either – it was almost effortless. The road curved and rose (it was about a mile of 5% grade) in front of me, lovely forest hugging the edges. sky top rd. the only way is up. It was truly a transcendent experience, one that I can’t adequately express to you dear reader in words. A few miles later, I was bombing down another rd, twisting out of the Watchtung Reservation and into Echo Lake Park. I ran into a few other cyclists taking a quick break so I opted to hook in with them for a bit (and refill water). I dropped back off in Kenilworth where Ken and Catherine were waiting (with others). Dave went back to captaining the tandem and Ken was back riding with me. At this point, the ride turns more urban as we meander through Elizabeth and into Newark. We rode through the Newark Port, which was mercifully devoid of vehicles (and unfortunately trees) after navigating city streets. We met up with another group and got Mike to drive behind our cycling groups to get over the Route 1-9 bridge into Jersey City. Craziest bridge to negotiate – I do not recommend attempting alone/without a car behind you to keep the New Jersey drivers away from you. A large swath of the bridge was open grate, which can be extremely slippery for cyclists. More city streets as we navigated our way to Hoboken and the ferry terminal. About a mile from the terminal, the skies opened up and we were doused with a torrential downpour. As in, we couldn’t see Manhattan across the river (and it’s not that far). After the hot and humid day we’d had, I can’t say the rain wasn’t welcome. Ken and I sought refuge under a few trees (which is totally not what you should do in a thunderstorm but we didn’t have any other options) until the rain let up enough to continue to the ferry. The ferry ride was a ferry ride – although we did see a beautiful rainbow over Manhattan. Once in Midtown, the sun came back out and we pedaled down the Hudson River Greenway. A lovely separated cycletrack with separate signals! We mused that this would be perfect for the I-95 corridor in Philadelphia, with the new development happening on the abandoned piers. Following the signs for cyclists getting to the Brooklyn Bridge we navigated the city streets. Always brings out the aggressively-defensive cyclist in me. The Brooklyn Bridge is beautiful. It’s also full of pedestrians who seem to think the bike lane is also for walking, taking photos, etc. It’s also got a wooden deck and after the rain, I was skiddish about needing to stop suddenly – so I employed my best “Get Out Of The Bike Lane” voice to clear the path. There are SO MANY PEOPLE in New York. We negotiated the final city streets, arriving at the hotel about 9 and three-quarters hours after we set out. We grabbed a cold beverage and a bag of chips while we waited for the showers to be available so we could clean up and change. Dinner at a local restaurant (MooBurger) before climbing on a bus to take us back to New Hope. Dropped off Catherine and Ken before getting home to my own family around Midnight – tired, happy, a little saddle-sore but tremendously thankful for the amazing experience. Philadelphia won’t be home for much longer and New York (although not Brooklyn) will be home soon – I can’t think of a better way to go out.